This little sculpture and I spent a LOT of time together. Several months to be exact. Back and forth, refining, starting over, refining again. I wanted the rich metal colors to come through in the balloon itself: copper, bronze, antique gold, all a little weathered as though it had been through clouds, and storms, and who knows! … perhaps a hurricane or two. The contrast of the weathered metal colors and the crisp white base with black marbling are striking, making the metallic detail of the tiny balloon more visible. The balloon itself is just over an inch tall, and the basket and support chains make it a little over 2 inches, touching on the wisps that might be an ocean creature or the tendril of a windswept cloud, the froth circling an oceanic sinkhole — or if this is a space-traveling ship, it could be the Rosette Nebula in the constellation Monoceros for you astronomy types. A ship’s wheel, an anchor, and weights all drape the sides of the balloon basket. When shaken, the balloon and basket are caught in a fog of shimmering white iridescent dust, slowly settling to reveal the tendrils below. For anyone who thinks: have I seen this snowglobe before? Perhaps you are thinking of “Rough Sailing” — a steampunk’d original snowglobe which I posted a few days ago. While I worked on the two, off and on, over the same period of time, they are not the same. More like fraternal twins, perhaps. There are many differences between the two globes, notably, “Sailing” has an airship with bright antique gold metal masts drifting below the balloon, and this one, “Uncharted Skies,” has a woven metal basket and a finer gauge of bronze chain connecting the two pieces. Two similar but very different modes of travel. For some messages, simple is best. A glass heart with an iridescent sheen catches the light, bound with brass and touched with a gold wire coil, antique bronze metal gear and a tiny hanging copper spring. When shaken, the heart bobs slightly on tightly coiled steel and is washed with a touch of reflective metallic dust, glittering and winking rainbows as the dust darts and dances in the liquid interior, and falls gently to the base. 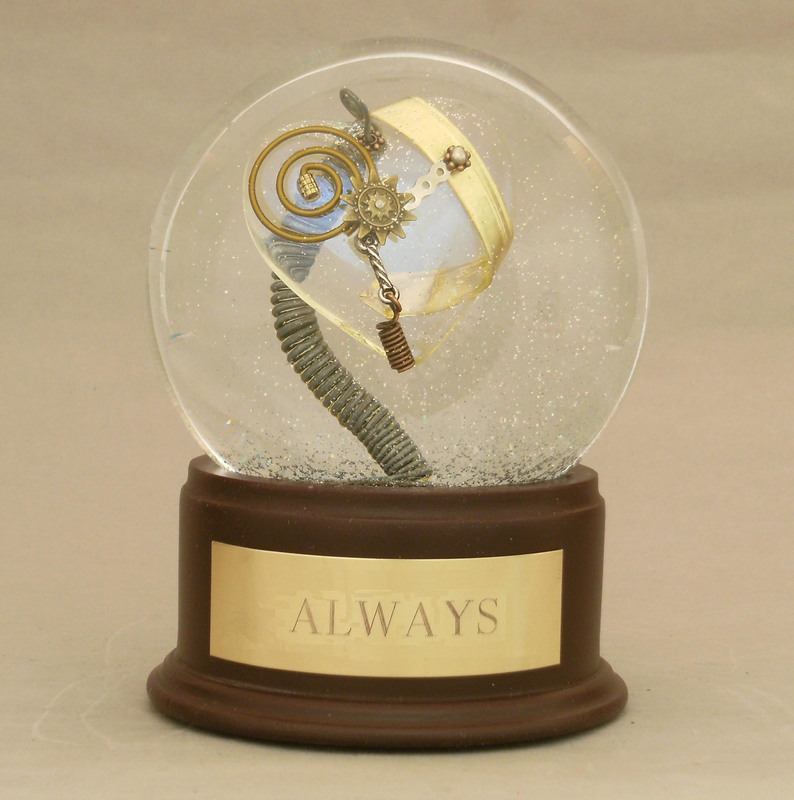 One-of-a-kind Steampunk Snow Globe, May 2012. All designs and photographs are Copyright (c) CamrynForrest Designs, Denver, Colorado. My first attempts at stairways involved figuring out how to break the perspectives forced on us so gracelessly by gravity, and create a tiny world that would have made M. C. Escher proud. Not that I’ve been there, done that, because I enjoy the results, but I decided to branch out. Escher tended to use similar looking people marching endless up and down stairs. And I had a thought: what else would be cool if gravity was random and up/down could be different for each participant? What if you took the staircase idea and made it a little more science fiction? Since the original sculpture is only 2.75 tall, I’m showing you the insert piece and three angles of the finished waterglobe. There are more than 5,000 species. They can fly as fast as 60 miles per hour (97 kilometers per hour). Dragonflies typically have six legs (but walk poorly), and prefer to fly, since they have a double-set of wings. Generally, I get a glimpse, and as soon as I start to appreciate their unique beauty, they are off, darting to another part of the universe. I was inspired to make this dragonfly snowglobe after meeting someone who seemed to be flying everywhere at once. I do not claim this artistic adaptation is scientifically correct, but it made me smile when it was finished. The dragonfly is mounted on a coiled wire spring, so it bounces slightly, like an insect holding on to a reed in the marsh on a windy day. Remember that Victorian ladies shoe that’s been on my mind? This time, I made the shoe and it had such a pleasing shape, arching as though ready to take on the world. Ready for the next big step. This globe was simple, that first step is always full of Good Intentions.